Upon Growth Factors (GF) stimulation, Receptor Tyrosine Kinases (RTKs) are able to trigger a variety of biological responses by stimulating a collection of intracellular signalling cascades. One of the major questions in the field of RTK signalling is whether specific biological events are evoked by the activation of individual pathways, or whether they rather result from quantitative differences in a generic signalling output. To modulate the signalling outcome of RTKs controlling developmental processes, we altered the ability of RTK docking sites to recruit intracellular effectors using a modified gene targeting strategy. This strategy has allowed us to generate for the first time RTK signalling mutant mice. 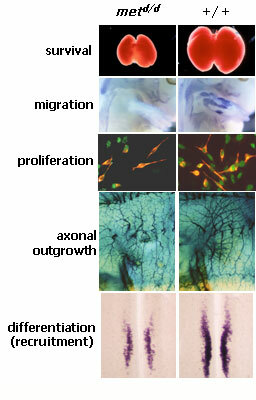 First, we have genetically demonstrated that in vivo the bi-dentate tyrosine motif that recruits different signalling molecules is required for all developmental events triggered by Met, like placenta, liver, muscle formation and axonal growth (metd/d mutants). We also showed that uncoupling Grb2 from the Met receptor selectively interferes with myoblast proliferation, showing that the direct binding of Grb2 is dispensable for all the other HGF-induced developmental processes (metgrb2/grb2). Next, we have generated mutant mice, in which the signalling capacity of Met was restrained to given pathways (met2P/2P and met2S/2S). 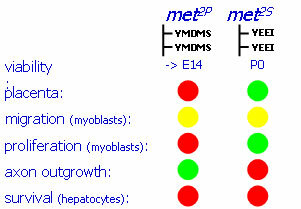 The phenotypic analysis of these met specificity-switch mutants demonstrated that, superimposed on genetic threshold signalling levels, distinct pathways are required to promote specific biological responses in targeted cells.